Sweet potatoes are one of the most higher nutrients first food for babies.They are high in Vitamin A and beta-carotene.Almost every baby love sweet potatoes! 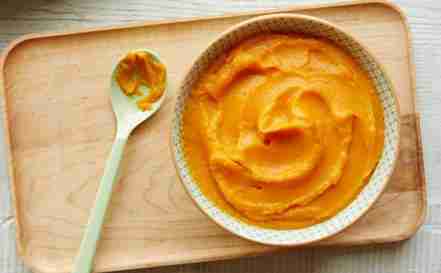 Follow our step-by-step instructions to make first sweet potato puree for your baby. 1/2 cup chopped sweet potato. 1. Select a sweet potato. 2.Wash & Peel the sweet potato. 3. 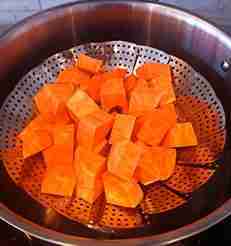 Now cut the sweet potato into small cubes. 4. Boil some water in a pot. 5. I prefer to steam the fruits & vegetables instead of boiling because it retains the most amounts of nutrients. 6.After water starts boiling, put the steamer on top. 7. Now pour sweet potato into the steaming basket. Then cover it with a lid. 8. Leave to steam cook for 10-15 minutes with medium heat. 9. The sweet potato is done when it’s soft and a fork goes through easily into it. 10. 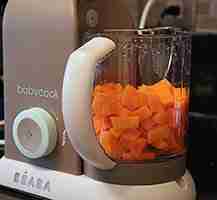 Now transfer the steamed fruits & vegetables to a blender. You can also use a food processor or hand blender. Add some water left over from the pot. Now blend it until becomes smooth. Finally, your delicious puree is ready to serve. Transfer some puree to your baby’s bowl. 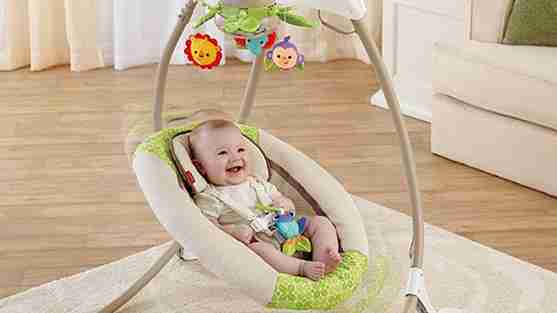 You can also pour the remaining baby food into a bowl. Then Cover it with a lid and can refrigerate for up to 2 days.